A former regional daily journalist who battled alcoholism while working as a reporter has won praise for speaking out about her experiences. Esther Beadle, left, who was assistant news editor at the Oxford Mail for two years, has gone public on her fight against the bottle while working as a reporter on the Aberdeen Evening Express. Esther worked in Aberdeen between 2012 and 2014, when she moved to the Mail, and has now written about her time there in a searingly honest post on her personal blog. She recalled one day when, after finishing an early shift, she drank two bottles of wine at home before moving on to pubs in the evening, returning to drink a bottle of gin before passing out for just over four hours before her next shift began. A few days later, she told her deputy editor at the Evening Express about her problems. In her blog, Esther recalled: “He was pleased I had told him. He was not expecting that. I’d been doing well with a run of decent splashes and had seemed so on top of things. “I couldn’t tell him about the baby I had lost. Probably through my drinking. Or about the dad that didn’t want to know. But this wasn’t his fault. I’d been on this path a lot longer than since that horrible lonely night in the bathroom with nothing but a clump of bloody tissue and a bare lightbulb to tell me what hadn’t happened. Esther was then referred by her GP to a counsellor called Christine, who worked with her for a year. Her blog has since received a positive response from former colleagues after she published it last week. 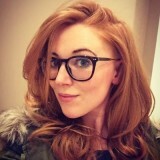 Esther told HTFP: “I am completely blown away by the response to this. I just got in on Wednesday night and needed to write, and just happened to start writing about what I went through in Aberdeen. I flung it up on the blog expecting perhaps a dozen views – certainly not this. “It’s perhaps a bit of a cliché, the whole soaked-up hack, but when it gets too much, the reality is scary. Yet the support I had from the newsrooms in Aberdeen and particularly in Oxford – for everything surrounding my mental health problems – was the best support I ever could have hoped for. “Yes, editors can be terrifying at times, but they can also be the most compassionate, practical and supportive people you could ever want fighting your corner. I lived through the haze when every lunchtime was a party in the pub with my mates, every leaving do a riot of never-to-be-forgotten japes and as for what went in between – the earliest I was offered a snifter from a pal’s hip flask was 8.45am. Between the lines I know that I was drinking far too much, especially in the evenings after hard graft at the coalface when I was really unhappy in my job. I could have been Esther, brave lady for telling it like it is. Given the far greater prevalence of booze nowadays I’d be surprised if there weren’t many other journos who have strayed down Esther’s route. We drink to drown our sorrows; we drink when we have something to celebrate or when there’s footy or rugby on the telly. Well done Esther. Your story will help others. I am pleased you have been able to put it all down in writing. I think it will help you. Best wishes. I remember going to the pub in the 90’s with colleagues, some had a few pints and back to work. One even drove after!! well done for speaking up. On one paper when I was youngish news editor I could do nothing with an older reporter after lunch except try to cover for him. Hugely talented, he was eventually sacked and died from his body being wrecked by drink. So it’s good to hear from someone who faced up to the problem and survived. It used to be standard procedure to down a few in the pub almost every lunchtime then head back to the office where you’d be assigned to cover anything from a death knock to a council meeting that same afternoon. Esther, I salute your bravery in speaking out about a problem that traditionally was a risk of the job in the old days, and evidently still is. That on top of personal problems. There but for the grace of God, etc. I remember my early days as a junior reporter, when it was de rigeur for hard-bitten old subs to sink a few pints and whisky chasers in the pub next door at opening time, to chain-smoke all through the five editions of the day, or if a non-smoker, to sit and breathe in the fumes from fags, pipes and cigars and go home reeking like an ashtray. One senior journalist of my distant acquaintance left in his wake a drawerful of empty Teacher’s bottles, and a criminal record for drink-driving. All in the past. For the present, I wish you every strength in your recovery and all blessings for a better future.